Lock in a great price for Onderwijshotel De Rooi Pannen Eindhoven – rated 9 by recent guests! Staff is good and helpful, my room was nice and clean. Hospitality School operated hotel. Fascinating, original and lovely. Everything was fine, staff very good. I suggest only to improve the choice of the breakfast in the morning. It can be bit better. Clean, quite, comfortable and big room. Nice view. The staff is polite, frendly and smillly. The concept of a training hotel. Dinner was delicious and great value. The room was absolutely on the spot, it was like in a 5* luxury hotel. I think it’s a real bargain for the money. Huge rooms. Very clean rooms and very well welcome. Room was biggest then average , very clean, Good location only 20 min walk to town centre,extremly helpfull staff, students done very well job. Onderwijshotel De Rooi Pannen Eindhoven This rating is a reflection of how the property compares to the industry standard when it comes to price, facilities and services available. It's based on a self-evaluation by the property. Use this rating to help choose your stay! 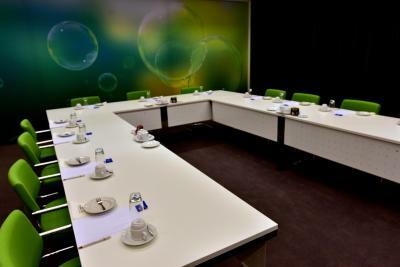 This teaching hotel is set 0.9 mi from the city center of Eindhoven. Onderwijshotel De Rooi Pannen Eindhoven is a hotel completely run by students in training. 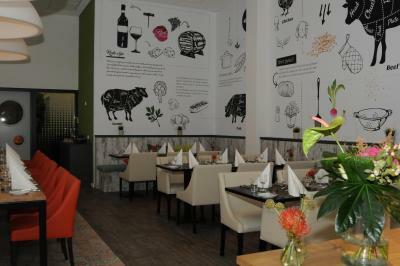 It features a restaurant, bar and business facilities. Free WiFi is availability throughout the property. Certain units have a seating area where you can relax. A flat-screen TV with cable channels is featured. The hotel functions from Monday Morning until Saturday Morning. It features 4 meeting rooms and 3 restaurants run by students. There is a 24-hour front desk at the property and free private parking is available on site. Tongelreep National Swimming Center is 3.1 mi from Onderwijshotel De Rooi Pannen Eindhoven, while Indoor Sportcentrum Eindhoven is 3.1 mi away. The nearest airport is Eindhoven Airport, 3.7 mi from the property. Woensel-Zuid is a great choice for travelers interested in city walks, friendly locals and city trips. When would you like to stay at Onderwijshotel De Rooi Pannen Eindhoven? This double room features a mini-bar, electric kettle and view. This room features an electric kettle, coffee and tea, as well as bathrobe and slippers. House Rules Onderwijshotel De Rooi Pannen Eindhoven takes special requests – add in the next step! Up to two children under 12 years are charged EUR 8.50 per night when using existing beds. ATM card Onderwijshotel De Rooi Pannen Eindhoven accepts these cards and reserves the right to temporarily hold an amount prior to arrival. Onderwijshotel De Rooi Pannen Eindhoven accepts these cards and reserves the right to temporarily hold an amount prior to arrival. 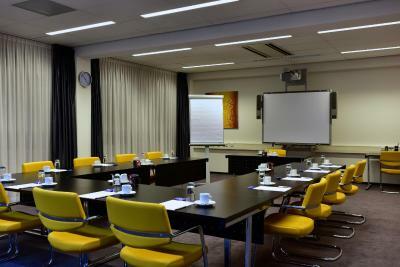 Please note that this hotel is part of the training giving at Onderwijsschool De Rooi Pannen Eindhoven. The hotel is rum by students only. Please note that the working hours of the hotel are Monday 8 hrs till Saturday 10:30 hrs. Please inform Onderwijshotel De Rooi Pannen Eindhoven of your expected arrival time in advance. You can use the Special Requests box when booking, or contact the property directly using the contact details in your confirmation. Please add slippers to the rooms and also breakfast could be better (the choice was limited). Maybe the location, it is a bit far from the centre, but the bus stop is at the corner so you can get in the centre easily. None et al. Maybe more signs to show main enterence. despite the fact that some people were really really slow (ok, they are students), service was ok. But there was no conditioning in the room, what made the temperature to rise till 27 in the room. location is good, free parking, its fun to see students working. breakfast is not wide, but its ok.